LEGENDARY educator Sr Elvera Sesta has revealed the reason why she’s stayed in the same school since she was eight years old. The renowned leader in Catholic girls’ education and columnist for The Catholic Leader, who turns 80 on May 1, has spent nearly seven decades at the same school to “remain young”. “Youth have honesty, integrity and enthusiasm, and those who work with them will remain young,” Sr Elvera said. 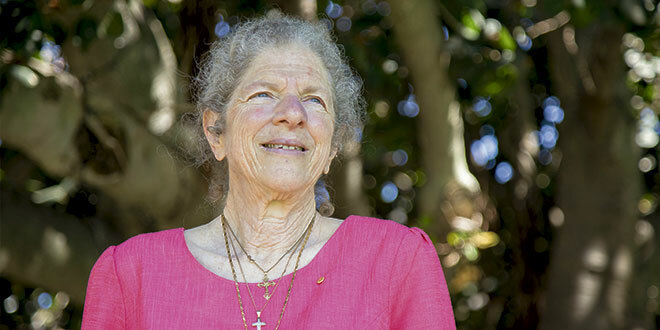 The “young” sister has often described herself as an “anomaly”, but in her 80 years she has become an inspiration to generations of young women at one school in particular – St Rita’s College, Clayfield. Sr Elvera was sent to St Rita’s College, a school founded by the Presentation Sisters, as a Year 4 boarding student in 1947 after her father died, and she has almost never left. “I look around here and I think I’ve been teaching around here older than these people here who teach here now,” she said. During her school years, she was Green House sports captain at St Rita’s and was awarded the college’s Prix d’Honneur, the highest award in the school, in 1955. She entered the convent of the Sisters of the Presentation of the Blessed Virgin Mary in 1960 and at the same time began teaching science and mathematics at her alma mater. After a long stint as a classroom teacher, Sr Elvera was named deputy principal in 1986, the college’s 60th anniversary, and became principal in 1989 for 20 years. Her love for teaching young women never wavered, and she now teaches Religious Education four days a week, co-ordinates the college’s extensive work experience program and is the college’s official photographer. She has spent no more than five years away from the school since becoming a teacher in 1960. In 2011, Sr Elvera received The Courier-Mail Queensland College of Teachers Professor Betty Watts Memorial Award for Outstanding Contribution to Teaching. She was awarded with the Medal of the Order of Australia in 2017 for her contribution to education and in the same year received the title of School Leader of the Year at the Community Leader Awards, hosted by The Catholic Leader. “I think the good thing about teaching is being able to impart knowledge. You need knowledge, because that’s the fabric you work with, and then once they get the knowledge, being able to do something with it and seeing the light go on in the head,” she said. Sr Elvera claims to have never done a day’s work in her life – she has loved everything she has done too much to consider it “work”. As a woman religious, who entered the Catholic Church from Greek Orthodox when she was nine, she said her Catholic values often underpinned much of her teaching. “I have a certain set of values where human beings are not the be all and end all of life,” she said. “There’s something beyond us and it’s something that you continually search for.